London: Macmillan and Co, 1898. First edition in English of the economist’s classic work. Octavo, original cloth. Translated by T. Boston Bruce. In very good condition with some rubbing to the cloth, name to the front pastedown. First editions are rare. Maffeo Pantaleoni was an Italian economist who was originally a notable proponent of neoclassical economics, and was a major contributor to the Italian school of economics known as 'La Scienza delle Finanze'. 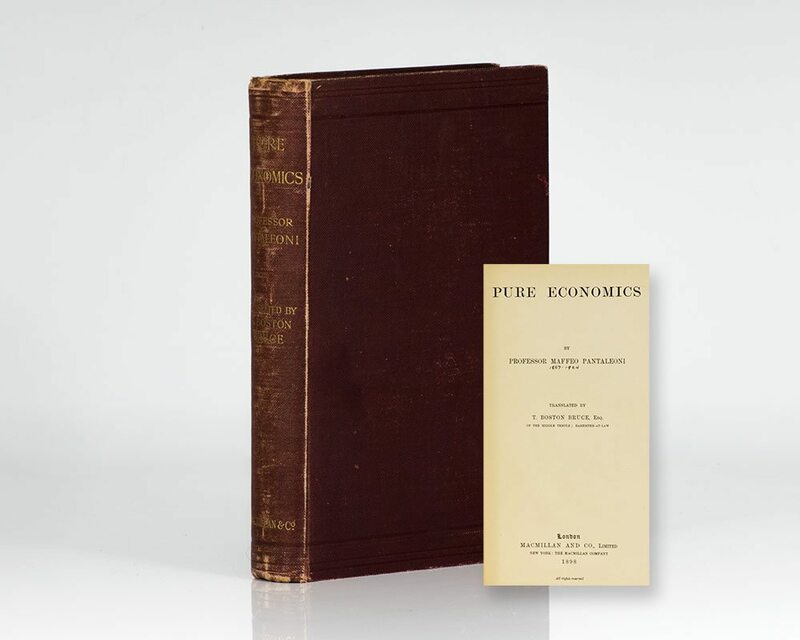 According to Nobel prize winner James M. Buchanan, Pantaleoni and his followers (such as Antonio De Viti De Marco and Vilfredo Pareto) can be considered the intellectual forefathers of the modern public choice theory. He was occasionally referred to as "the Marshall of Italy", because of his unrelenting defense of laissez-faire economic policies.